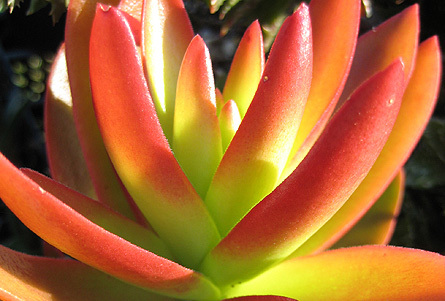 Hot and dry conditions give succulents their distinctive and unusual forms. 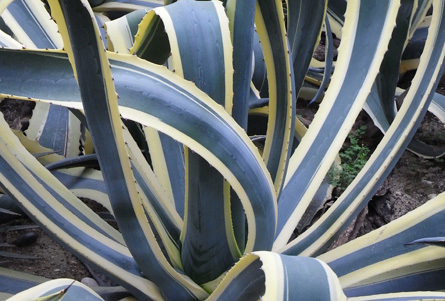 Adapted to store water in leaves, stems or roots, they're resistant to long periods without rain. Leaf succulents store water in fleshy leaves. Leaf shape, colour and surface texture varies greatly among species providing a designer palette of choices. Some have their leaves arranged in a rosette as an adaptation to catch water and reduce evaporation that also makes for year-round sculptural interest in the garden. Stem succulents retain water in a swollen stem: usually columnar, spherical or jointed. 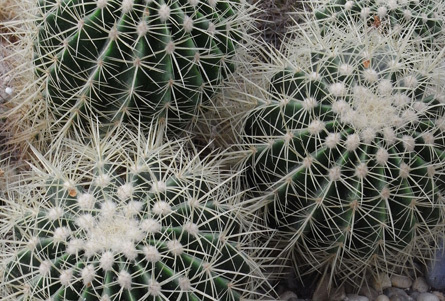 Cacti are stem succulents distinguished by unique growing points called areoles from which showy short-lived flowers, leaves modified to thorns and all their growth occurs. The architectural outline of the stems gives them much of their character but the thorns can be also decorative: arranged along ribs, coloured, hair-like or curved. A water-storing swelling only at the bottom of a stem where it meets the roots is called a caudex and the bottle-shaped form of such succulents is called caudiciform. 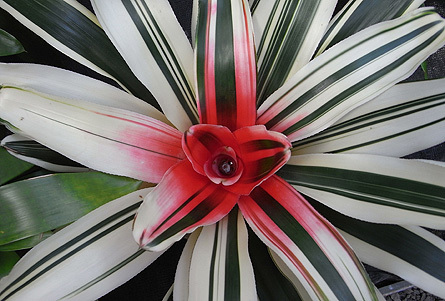 Bromeliads are also arranged into rosettes but their strappy leaves absorb and channel water into the central cup so they can survive in drier and quick-draining areas of the tropics and sub-tropics. Their symmetrical shape and bright flowering bracts are highly ornamental, and some also have coloured or variegated leaves. Bromeliads are monocarpic and start to die after flowering but will produce new offshoots called pups. Epiphytic bromeliads - growing on but not living off other plants - are useful for vertical gardening. The structural forms of succulents suit contemporary and formal gardens. Needing good air circulation and drainage, many succulents can be spaced and set up on their own in a pot or as a feature set against a background of gravel mulch. Whereas bromeliads fit better into tropical designs, the drought-tolerance of succulents suits dry-style and mediterranean garden designs. Succulents get better air circulation and drainage when well-spaced and set up on their own in a pot or as a feature set against a background of gravel mulch. Palmetto Soft Leaf Buffalo is ideally suited as a lawn in many applications. Get the Plant Selector's full features plus news, forums & competitions. Sign up, it's free.